Pleased with DIM-PRO and very pleased with fabulous service and shipping. 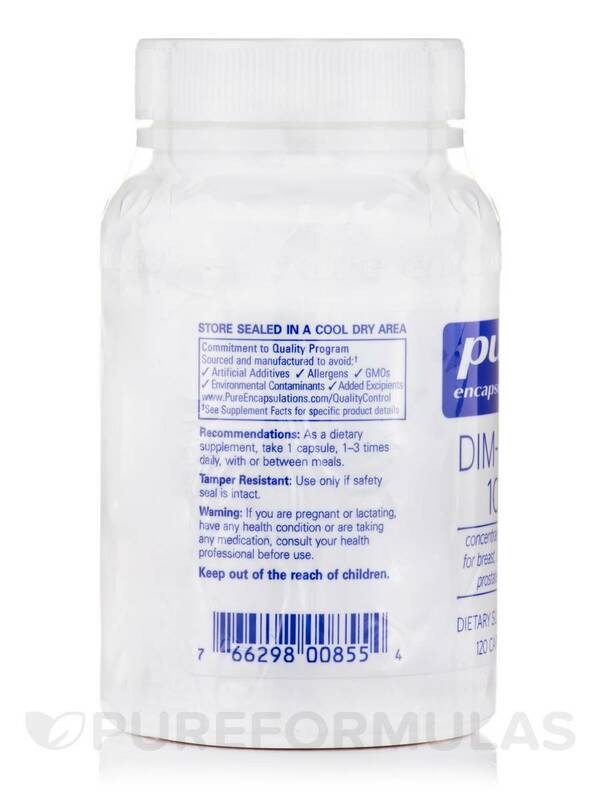 This DIM PRO by Pure Encapsulations is a must for reproductive support! Thank you for carrying this product. DIM-PRO by Pure Encapsulations is a life saver! It keeps my hot flashes at a minimum...and makes my life bearable! Indole-3-carbinol (I3C) is a substance naturally contained in broccoli‚ brussel sprouts‚ kale‚ and other cruciferous vegetables. Your body works to produce metabolites like diindolylmethane (DIM) from I3C when the latter reaches the gastric acids in the stomach; in some cases‚ it may be more effective to take a DIM supplement directly. That's where Pure Encapsulations' DIM-PRO® 100 comes in. Why should you care about DIM? It may support the healthy functioning of the cell cycle‚ which is the process that every cell goes through. This cycle allows cells to grow‚ mature‚ and perform their required functions effectively. If the cell cycle isn't working properly‚ it may contribute to health problems. Both men and women can benefit from DIM-PRO® 100. Diindolylmethane may have a positive impact on breast and cervical health. For breast cells‚ DIM may promote detoxification‚ healthy enzyme activity‚ and gene expression; the breasts themselves may also feel more comfortable. This supplement may also support the health of cervical cells. Furthermore‚ DIM can support a healthy prostate; it does so by helping maintain healthy gene expression in the prostate cells. 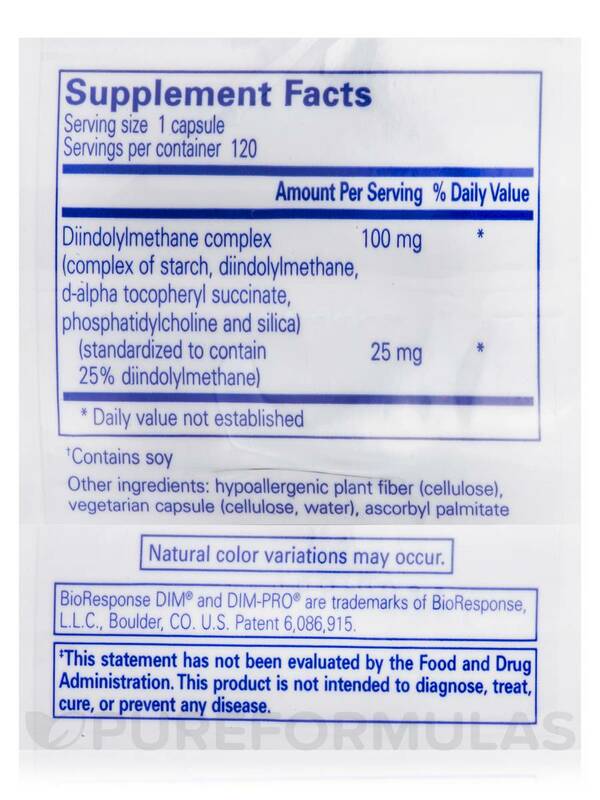 BioResponse DIM® is the form of diindolylmethane in this supplement. It has been uniquely formulated to ensure increased absorption when compared to standard indole-3-carbinol; therefore‚ it may be the right fit for those with low gastric activity. One capsule provides 100 milligrams of this DIM complex. Take one to three capsules daily‚ in divided doses. You can use this supplement either with or between meals. 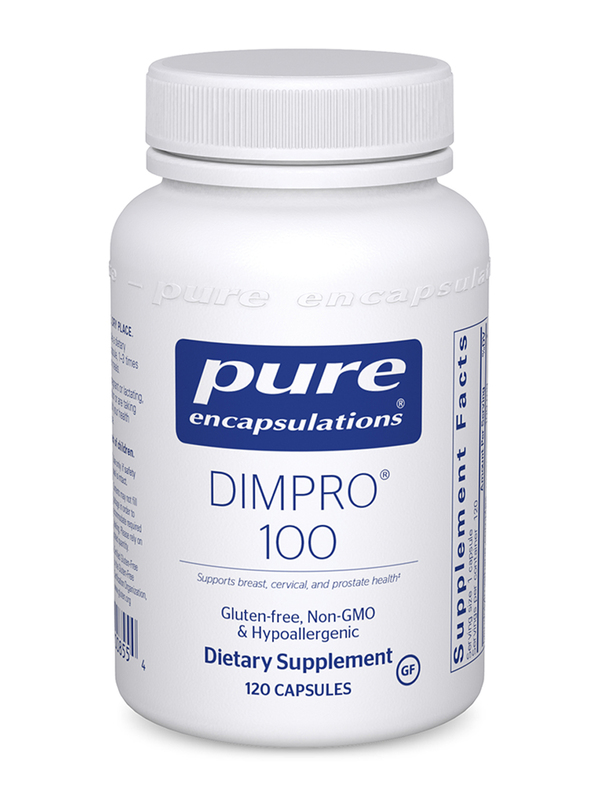 Each bottle of DIM-PRO® 100 by Pure Encapsulations contains 120 capsules‚ which should last from 40 days to four months. 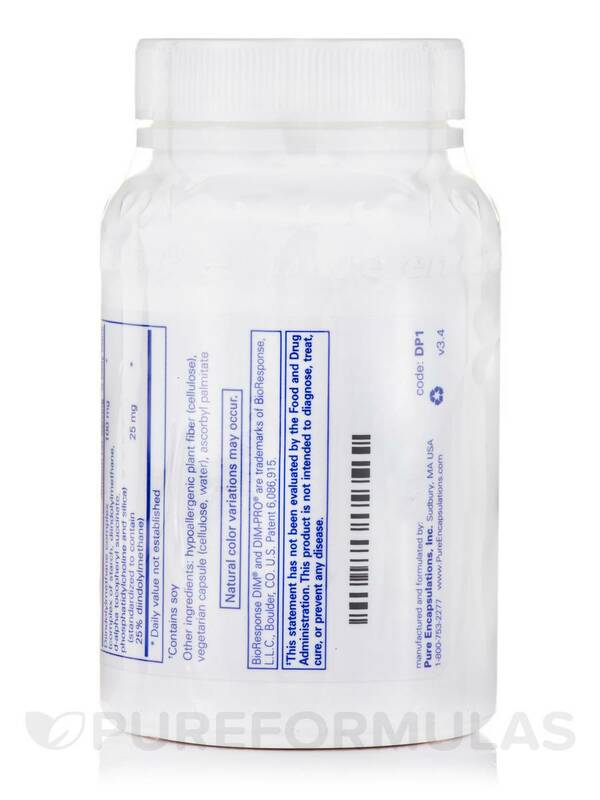 Other Ingredients: Hypoallergenic plant fiber (cellulose)‚ vegetarian capsule (cellulose‚ water)‚ ascorbyl palmitate. As a dietary supplement‚ take 1 capsule‚ 1-3 times daily‚ with or between meals. DIM PRO by Pure Encapsulations is a great supplement for anyone, but especially vegetarians. The sources are all non-animal. This is a good product for all ages/activity levels. It's covering the basics of protein needs. Easy-peasy to take. 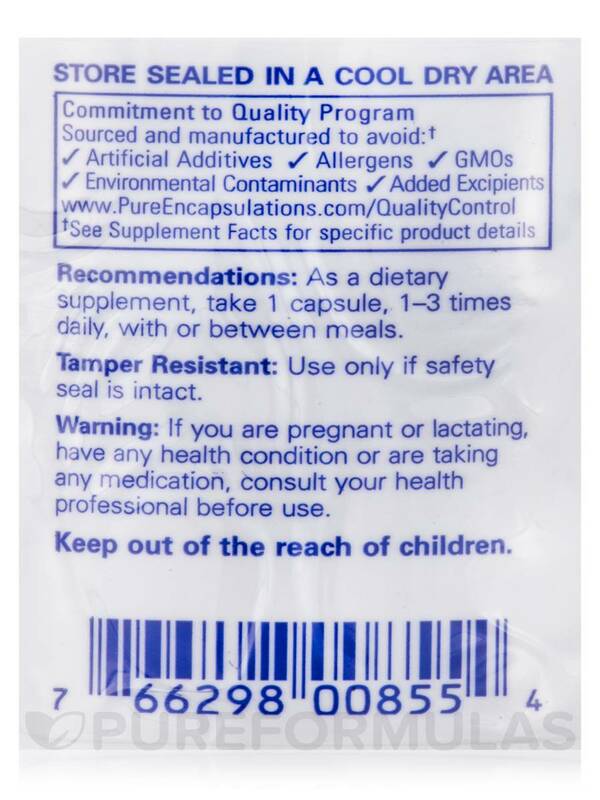 Three to six capsules between meals. It doesn't irritate my stomach, but I think it encourages activity. I have been taking Dim-Detox, and DIM PRO by Pure Encapsulations for several years for breast health issues. Last year I was diagnosed with lobular breast cancer in my left breast and had a partial mastectomy. I continue to take Dim-Pro and Dim-Detox on a daily basis and will take it probably for the rest of my life. It was recommended to me by my accupuncturist, who sells Pure Encapsulation products. She thinks very highly of the brand and I trust the quality of these products and will keep ordering them!